Wrath Of The Titans Blu-Ray Review And Giveaway - Are You Screening? While I didn’t particularly care for Wrath of the Titans, and our podcast review didn’t exactly sing its praises, there’s a market for just going wild, and the particular lull of summer fun we find ourselves in means this isn’t a bad time to take a look at other options for your action-adventure fix. The overall story leaves something to be desired, and the special effects eventually get to a point well beyond the law of diminishing returns, but if you’re up for letting loose, it’s certainly hard to find more action crammed into one film. On the legitimately positive side, this is a title that benefits immensely from the Blu-Ray release’s Maximum Movie Mode, and the points you get on this one (see full list below) deliver possibly the best feature connections you’ll find in such bonuses. Working in featurettes that cover the labyrinth, the battle scenes, and explorations of the myths behind the story, taking in the full experience of this mode actually surpasses the entertainment value of the film itself. This particular installment of the MMM gives you two options for your viewing pleasure – The Path of Men, or The Path of the Gods. Each delivers its own spin on things, with its own emphasis on certain featurettes. Somewhat surprisingly, the Blu-Ray release actually makes for a pretty good purchase, even if you didn’t love the film. It looks great, and there’s a lot to look at here, and this comes together to make a fun package. I’m not even usually a fan of the Maximum Movie Mode, but it’s found it’s calling here. Even the battle analysis featurettes, especially the one with the Chimera, are a lot of fun, and they are the sort of thing that are usually at the bottom of my special feature list. Check out more info, some clips and images, and enter to win below. Wrath of the Titans available on Blu-ray Combo pack, DVD and for download today! 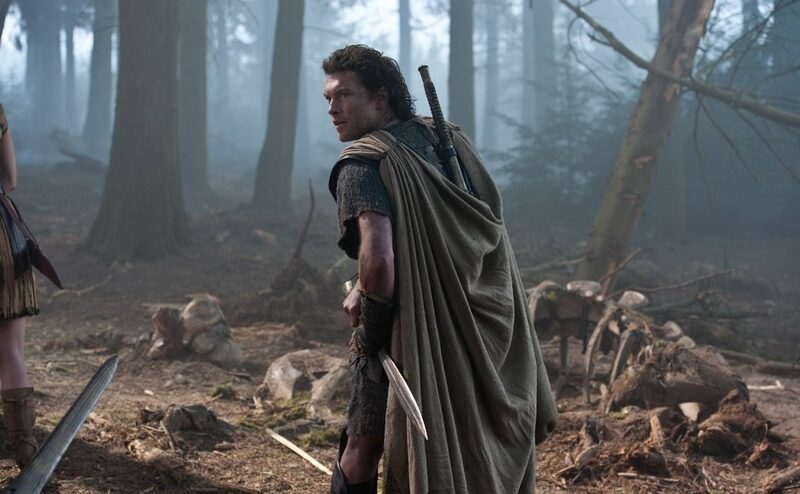 Saving the world means “going to hell” in “Wrath of the Titans,” arriving onto Blu-ray 3D Combo Pack, DVD and Digital Download on June 26from Warner Home Entertainment Group. Perseus, the half-human son of Zeus is once again on a quest in “Wrath of the Titans” as the dangerous Titans, imprisoned in hell, threaten to rise up and overthrow the gods of Olympus, unleashing chaos and destruction in their wake. Jonathan Liebesman directed “Wrath of the Titans” from a screenplay by Dan Mazeau & David Leslie Johnson, story by Greg Berlanti & David Leslie Johnson & Dan Mazeau, based on characters created by Beverley Cross. The film was produced by Basil Iwanyk, who also produced the previous hit “Clash of the Titans,” and Polly Johnsen. Sam Worthington leads the international cast, which includes Rosamund Pike, Bill Nighy, Edgar Ramirez, Toby Kebbell and Danny Huston, with Academy Award® nominees Ralph Fiennes (“The English Patient”) and Liam Neeson (“Schindler’s List”). The Blu-ray 3D Combo Pack features a 3D hi-definition, a hi-definition, a standard definition copy of the film and UltraViolet; the Blu-ray Combo Pack features a hi-definition, a standard definition copy of the film and UltraViolet; and the single disc DVD features a standard definition copy of the film and UltraViolet. All include UltraViolet which allows consumers to download and instantly stream the standard definition theatrical version of the film to a wide range of devices including computers and compatible tablets, smartphones, game consoles, Internet-connected TVs and Blu-ray players. Now, Perseus cannot ignore his true calling as Hades, along with Zeus’ godly son, Ares (Edgar Ramirez), switches loyalties and makes a deal with Kronos to capture Zeus. The Titan’s strength grows as Zeus’ remaining godly powers are siphoned…and hell is unleashed on earth. Enlisting the help of the warrior Queen Andromeda (Rosamund Pike), Poseidon’s demigod son Agenor (Toby Kebbell), and fallen god Hephaestus (Bill Nighy), Perseus bravely embarks on a treacherous quest into the Underworld to rescue Zeus, overthrow the Titans and save mankind. o Deleted Scenes and more!